Tracy DiTolla: When did you first decide that you wanted to be an artist? Was there a specific clarifying moment for you? Ken Weathersby: In high school I was hanging around with people in rock bands. I was interested in drawing, writing and music, most excited by doing creative things. By my first year of college I was depressed and desperate because I didn’t have a sense of what to do with myself in the future. Becoming an artist wasn’t particularly visible as a path. I couldn’t see any path that interested me. In retrospect I understand that growing up in the south, in Mississippi, gave me limited exposure to cultural possibilities. At the University of Southern Mississippi I eventually took some studio classes from a professor who told me I had a “damn gift” for art. He also challenged me with an ultimatum: that I should either get serious about art (I was just drifting) or get the hell out of his class. That was a turning point. I didn’t get the hell out. Instead I got really involved with painting. After college I went on to graduate school for painting at Cranbrook in Detroit. After completing my MFA I moved back to Mississippi briefly, but after a couple of months I packed up and moved straight to New York City. TD: You often cut out or cover certain parts of images or of the canvas. What leads to your decision to take things away and replace them with other images or materials or geometric designs? KW: I want to make a thing that does something particular and specific in relation to your act of looking at it. 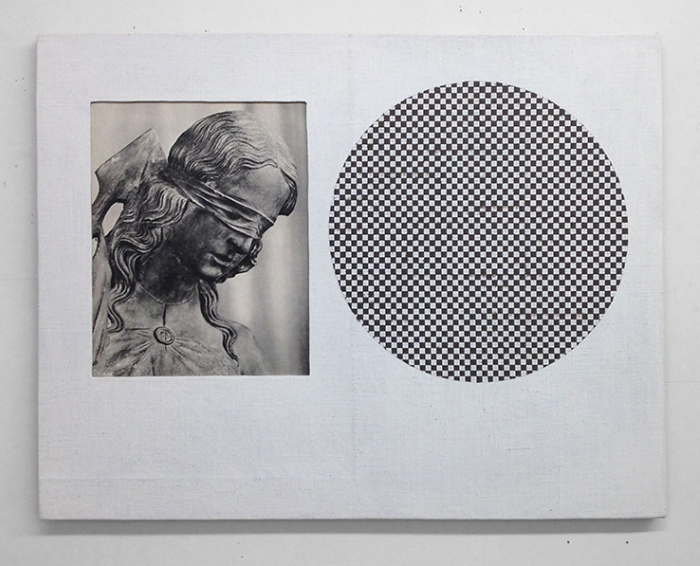 The way the parts of the painting are arranged might deny you full access to what one would assume is made to be seen, like when the painted face of the canvas is hidden. Maybe a painting is foregrounding something that is normally just a non-visual support, like the wooden stretcher or staples. It could be transposing its parts in a way that presents like a puzzle, or messing up your perception of a pattern with slight displacements, like a grain of sand in an oyster. Generally each painting is doing something different. For a number of years, I was doing this in a visual language that was geometrical, abstract and material, but excluded representation. Occasionally I borrowed human shapes from sculptures or paintings from art history, but they would be barely recognizable as figures the way I used them, just contours filled in with painted pattern. More recently, though, I’ve been introducing collaged images into that situation. Usually they are photos of heads or figures from ancient sculpture. The presence of these entities speaks to the act of looking in different ways. They can become a kind of proxy for the viewer, reacting to some abstract thing within the painting which they connect to with their gaze. So they model or re-enact our encounter with the painting itself. Or sometimes they are bursting into the middle of an abstract painting, as if they had opened the wrong door by mistake. It’s another angle on the idea of an encounter. The through-line in all of it is looking at an unknown thing or situation and pointing to the space of not knowing. TD: The painting, 256 (girl swimmer), seems to be a good example of your recent practice. Can you talk a little about this piece? KW: The two collage elements are photo illustrations that I found in old books. 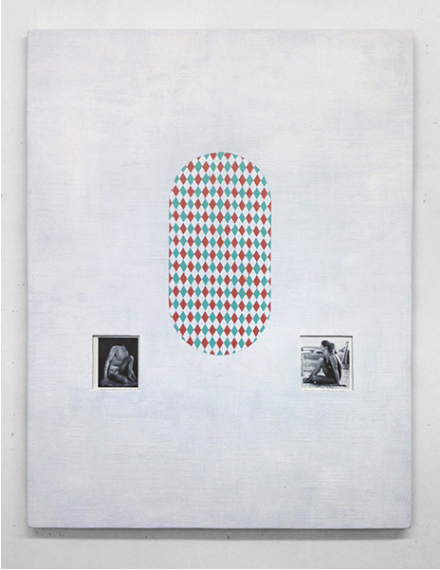 The one on the right is the image of a girl resting near the water and looking off toward the center of the painting, where there is an oval of abstract pattern painted in contrasting colors. Below the photo you can read part of the caption, which identifies her as a “girl diver”. I changed the description a little to “girl swimmer” in my title. On the opposite side of the painting, mirroring her position is a photo of a classical sculpture. Its head is missing, but the body is at the exact same scale and in the exact same posture as the girl. It is a mirror image of the girl, but it is a boy. It too would be looking toward the abstract form in the middle of the painting, but it lacks a head, and therefore can’t look. TD: What is the reason for the titles of all your works being numbered? KW: I title them with numbers as a practical way of keeping track of them. It distinguishes them from one another and the numbers represent the order in which they were made, so I can know chronology. I tend to avoid more evocative titles because I want to leave people’s responses more open-ended. I don’t want to over-direct interpretation, which, for better or worse, is up to the viewer. I sometimes add in a parenthetical title, if one emerges organically while I’m working. If I want to add one of these titles to the number on a piece, but think it would be too much, I will compromise by reducing that part to just initials, a kind of code. TD: You have said your work is very concrete and is all about the physical aspect of it, but you often incorporate images from ancient and medieval art history into your pieces – are the choices of collaged images you include in your work based solely on aesthetics or does their original meaning and context play a role as well? KW: Before, I was playing the physical against the optical. It was the material structure of the thing played against the abstract painted image. Now I’ve added in the images of human beings by way of these photographic reproductions of historical sculpture, taken from art history books. It’s a convention of the medium of painting historically to draw upon classical figures in composing a painting, as, for example, Manet did in composing “Le Dejeuner sur l’herbe”. I am using that convention but in a more blunt and contemporary way. Usually I pick these images based on what they are doing, their gestures or movements, and especially on how they seem to be casting their glance in a particular direction, and the nature of that glance. In cinema there is the basic mechanism of the eye-line match. 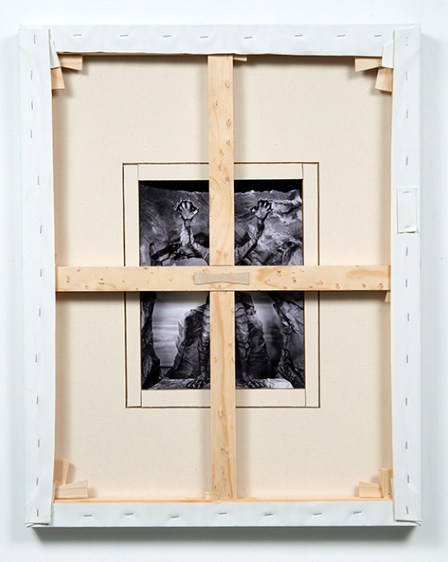 A figure looking in a certain direction relative to the frame of the screen will make a strong connection in the viewer’s mind to the thing shown in the next shot, after a cut. I am working with cuts too. Cutting into the canvas surface literally, and also in the sense of putting things side by side that might seem to exist in different spaces and times. But the eye-line makes a connection. Since the particulars of the situation differ (each figure is different, each painted pattern is different and their placement in relation to each other is different) different implications emerge. TD: The figurative, collaged elements in your work are, in part, to direct the gaze of the viewer – is it important to you to have some control over the viewer and how they look at your work? KW: It’s not about controlling how they look at my work, but about going into something that isn’t always explicit in art. This is the situation and space of looking. When I first started painting, I was interested in op art, and my first paintings that worked were about optical effects, grids of calibrated color that were retinally active. That kind of painting throws the viewer back on their own acts of looking. They can become aware that what they see is tied to their own eye movements and other visual apparatus. That is stuff we are usually free to ignore when looking at other types of painting. It implicates us in the experience and ties us to the object in a conscious way. In addition to that, in my work now, I am placing different spatial dynamics side by side with the abstract and optical, and giving you the dissonance between them as something to experience. On one hand, there is a frontal space, where the grid or abstract geometric image is projecting out at you, and generally doing some of the stuff I mentioned above. That is happening in a perpendicular axis, between you and the painting. Opposing that is what I call a diagetic space, where the eye-line (or sometimes other elements) promotes a lateral reading within the space. That tends to create a slightly fictive or even narrative space while the other type of space is more iconic. In historic art there are precedents for this. For example, in a Duccio altarpiece, you have an iconic Madonna or whatever in the center staring out at you, confronting you as you confront her, while around the rest of the painting you have angels or other figures looking at each other or moving laterally through a depicted space. The two things co-exist but are contradictory and it provides a certain energy to the painting. TD: You seem to have an interest in texture, what brought the change in your recent work – stark, white canvases from the black canvases with random brushstrokes, and the backward canvases and pieces with wood? KW: I do like texture. I think of that now mostly in relation to how something is made, and that it is made by hand. I don’t go out of my way to produce a certain texture, but I allow my methods of putting things together, using wood, paint, linen, graphite, old photos on paper, etc. to show, and to have a level of roughness as well as a level of precision. The relationship of those two things co-existing (looseness and an idea of perfection) can be interesting. It’s not my main concern but it is part of how I work now. On a certain level, having little runs in the paint or visible layout lines of graphite, or spots of glue just gives the viewer something to see when looking at the work closely, a reason to zoom in. It gives clues to how things were made, but I’m not committed to an earnest idea of truth to my materials and processes either—sometimes I play with that situation to “lie” with the material structure, to let it look like it is put together in ways that it is not. That’s just more of what is happening in my work generally: playing around in various ways with the ambiguities of looking at a thing or situation. Ken Weathersby is an artist from Mississippi who has been making paintings in New York for twenty five years. Mississippi Modern recently got the chance to talk with him about his process via email. Mississippi Modern: When I look at your paintings, I can’t help but think of sound. I can almost hear your paintings. I think it has to do with the tightness of the grid with which you work creating a kind of visual buzz. That buzz carries with it a timbre that is specific to each painting. And when you decide to deviate from your grid, it’s almost like a chord progression. Can you speak to this? Do you think in terms of sounds or vibrations when you create your paintings? 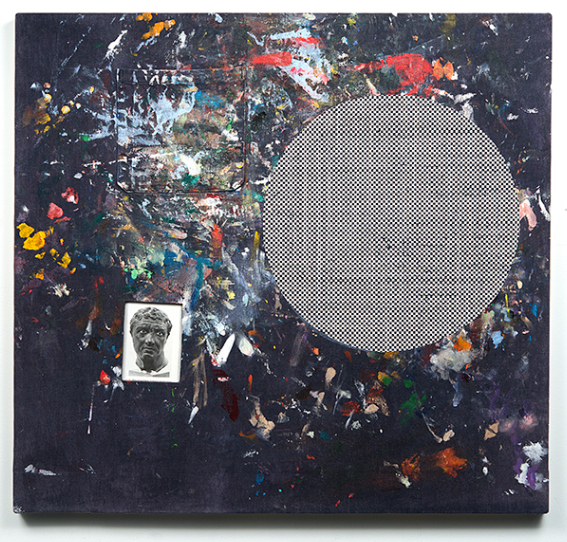 Ken Weathersby: I am primarily thinking in spatial and visual terms—the painting ideas come to me specifically as something to be seen, yet I do know what you mean about music. The retinal thing that happens with the grids can definitely seem like a kind of buzz or hum. The deviations from the grid that you mentioned come in a couple of different ways. One of those is the kind of deviation that emerges in the form of glitches in the pattern—when the paint runs or bleeds a bit, or when adjacent rows don’t quite meet or overlap. It’s not intentional, but I allow it and it is always a matter of deciding how much to interfere with that. Since most of what I do is done exercising as much control as I can, it’s interesting for me to see what productively escapes that control, to find out when precision matters and when it doesn’t. For me, calling those phenomena “glitches” comes from electronic music that uses glitches, incidental sounds, as elements of composition, like in the music of the band Oval. The other kind of deviation from the grid, I don’t know if this is what you mean, but another deviation is the things that happen to break up or open or undermine the dominance of the visual, painted surfaces. Things like cutting into the paint film or inverting it, or setting it next to or behind something more structural. If I was going to refer to that aspect in musical terms, I might talk about it as counterpoint rather than chord progressions. It is about opposing something with something else to create a standing relationship of difference (or dissonance). MM: Another reason I relate your work to the auditory is your fascination with the parts of the paintings, parts that have to be experienced over time. It’s not as if the deviations from the grid are surface level movements. You actually cut into your canvases and create smaller canvases that fit into the holes you create. Some of your paintings have to be experienced in the round because you’ve given precise attention to both the front and the back of the canvas. You’re clearly obsessed with the parts that make up the painting: the support system, the canvas itself, the insets, and the paint. There’s so much attention one has to pay to the pieces that it’s impossible to see it all at once. It becomes atemporal experience; the things evolve over time, similar to music. Can you talk about the parts, the thingness of the paintings, and their relationship to time? KW: I like the idea of time in the work. The relationships in the paintings pose a kind of puzzle or problem for the viewer, so there is some time built in to looking at them, to working out what one is looking at, or is supposed to be looking at. This happens in different ways and on different levels. The cutting in or reversing or realignment of parts, whatever operation I’m performing on the basic given of a painted stretched canvas, is central. The reason I make the paintings in the first place is because of some initial strange thought, some kind of bothersome idea. For example, a recent idea was to have an abstract painting that was the embodiment of a wholeness and singleness of form suggesting a presence. So it would be something with a concentric, unitary pattern, it would be human-scale and free-standing. Then at the same time I wanted to fracture that whole thing into a thousand pieces, but leave it still standing, fragmented, but poised and holding together. I wanted those two aspects together. So it was a kind of simple, dumb idea in a way, but an idea of a tenuous situation of things in opposition, whole and parts. But then it becomes a question of how that will happen, which entails a lot of visual decisions and a lot of physical working out of structural factors. There’s a dialog between the parts: the retinal and visual, the structural and supporting elements, the flaws or glitches, the image presented and the gaps in that presentation. There is time in it that way too—time invested by me thinking this stuff through, though that kind of time may or may not be visible in the result. MM: That attention to the actuality of the painting (these are really just stretcher bars, this is actually canvas, etc.) again reminds me of music in the sense that we don’t ever expect music to be anything other than music. One can argue over whether or not a painting should be read for its literal content (the subject matter), but that’s a hard thing to do with your work. I am forced to experience your painting as an actual painting that can’t be read for characters or story because you often don’t include subject matter in your work, and when you do, it’s so enveloped in the formal qualities of the painting, that it almost ceases to exist as subject matter. The representational moments are seemingly playful little nods to art history that pop up with such scarcity that I can only assume they mean a great deal to you. What do you consider to be your subject matter? How do you choose the few representational elements that you include? KW: I don’t think literal content on its own means anything in any art form, really. Every supposedly literal thing in art is embodied somehow, and the how is entirely involved with the what. So—my subject matter is a poetry that uses the given parts of the language of painting, both with and against itself. My interpretations of what those parts are, and how they can be related or reshuffled, are where there is a chance for something interesting to happen. For a while now I’ve occasionally picked up images of figures to use in my paintings, most recently, images cut from art history books, often of classical sculpture. The main thing I’m looking for is how the figure will connect or contest with other aspects of the painting it is in. I consider the figures and their connotations material I can use on a par with the physical aspects like wooden stretcher bars or canvas, as another part of the given language and conventions of painting. I choose the particular collage figurative elements I do because they have directional gazes or other aspects that I can use, and because they have a certain humor or implications when put next to something else. MM: You’ve been living and working in New York City for some time now, but you grew up here in Mississippi and got your bachelor’s degree at Southern Miss. The muted tones and exposed wooden stretchers to me reflect an admiration and respect for craftsmanship and honesty, the kind of blue-collar values that can be found across Mississippi and the South. How have your experiences here in Mississippi shaped the work you make now? Did the education you received here impact your trajectory in a meaningful way? KW: I admire good craft, but I don’t particularly think of myself as being involved in that. I don’t mean what I do to be homage to craft, and I don’t really know what I’m doing as a carpenter or woodworker, at least in the sense of being trained in that. I make up my own ways of putting things together, and find it a very engaging process. I do think a lot about how to make my pieces physically strong and stable and as simple as possible while giving me what I want visually. It’s interesting that the handmade aspect evokes ideas of Mississippi and the South for you—I’ve had people come into my studio and tell me I am making a structure like something that was part of the house where they grew up in Japan, or that it is like a thing that people in Brazil traditionally make. The wooden lattices especially seem to inspire this response. They get a certain look of complexity because of the layering, but they are basically very simple. Through that simplicity they seem to touch on or be reminiscent of lots of different things, while still being rather particular. I did grow up on the Mississippi gulf coast and lived in Mississippi up until the time I left Hattiesburg to go to graduate school at Cranbrook (near Detroit), but I don’t think the constructed aspect of my work is really connected to Mississippi. My education at USM did have a great impact, though. Jim Meade, Vernon Merrifield and Jerry Walden were my teachers and I got a solid introduction to modern design, color theory and other formal ideas from them. The physical structure of my paintings I think started from other sources. Years ago I had a spontaneous vision of one of my paintings making a gesture. In a kind of daydream I saw the painted canvas extend out from the wall and turn around to face the wall, turning its back to the viewer. It was a gesture of refusal, a refusal to be seen. That image took some time to digest, but eventually I began to work with the idea. 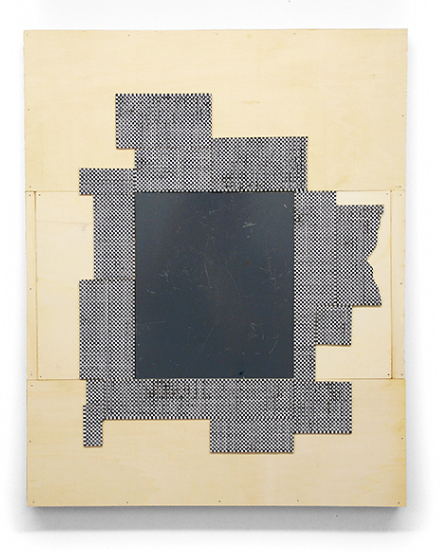 One implication that emerged was that when this happened, while the painting’s face (the part made to be seen) became invisible, other parts (stretcher, unpainted canvas, staples) were suddenly things to be dealt with. A more basic and substantial insight was that paintings actually have parts in that way, that while normally just the painted image was assumed to be the whole thing, paintings actually have this array of parts that traditionally exist in a hierarchy, some of them invisibly supporting and serving that face. The wooden structures and lattices and all the unusual things my paintings do started with that thought. MM: As a successful artist exhibiting in New York, What advice can you offer aspiring and emerging artists in Mississippi? KW: I will accept being called a successful artist if we use the following definition: I am having a life that is very focused on art, and I am making the art I want to make. I am wary about dispensing general advice. People are different and have different goals, and maybe different definitions of success than mine. I would recommend doing the best work you can possibly do. Though it felt risky at the time, moving to New York twenty five years ago was a crucial decision for me. Maybe when those aspiring and emerging artists in Mississippi come to New York we can have a conversation about these things. I’d like that. Mike Rutherford at Painter's Bread interviewed me about my work. "I have claimed that if there was an easier way I'd take it, but apparently the difficulty is connected with what the work is about, and maybe I'm less interested in the easier way." Can you talk about a new piece you’re working on? Hmmm, some are going to be free-standing: do you still call them paintings? Yeah, they’re paintings. Sometimes people want to know if it’s becoming sculpture-- the answer is no. It’s important to me that they remain paintings. Responding to the conditions of painting gives me a context, something to mess with. What are those conditions, for you? I mean the given, physical terms of painting, like paint, linen, wood, but in my own way of understanding what they could be. For example, simple patterns fulfill my requirements for painted image. In my paintings those various given terms tend to get outside their usual roles, do different things. Sometimes the linen support and the painted front switch places. Sometimes the wood gets itself in between the paint and the linen. Paintings seem to be undoing something about how they would normally work. The undoing can be a blunt confrontation or an almost invisible cut or substitution. Well, the optical effects suggest spatial illusion or movement, but without depicting anything. And because the scale of the patterns is tiny, there’s a sense of compression. The strongly contrasting colors that you see from close to the surface cancel each other out from a distance and can begin to turn gray from across the room. What's been the effect of making miniatures for your shows? Do you see them now as works on their own? I’m thinking about the ones you recently showed in California. I started making very small pieces a few years ago, as a way of thinking through paintings, and to see what they might look like before making them on a larger scale. I also made a tiny scale model of the gallery at Pierogi before my show there in 2010. So it started as just a pragmatic process. But the feeling of seeing things reduced very small or, when next to full-sized pieces, seeing the huge leap in scale, became interesting, trippy, like Alice in Wonderland. It becomes uncanny and gets the imagination going. I showed twenty-two very small works, most just two or three inches tall, at “Some Walls” in Oakland in 2011. So that moved the small paintings into the realm of “works on their own”. I’m now creating new groups of small paintings around the ZTE (zombie tableau ensemble) idea. The miniature version has additional interest for me in this case, since to establish the tableau feel, I’m positioning them inside little room-like boxes that I also make. The box itself is something I think of as a kind of folded-up painting. This lets me think about more physical conditions of painting that join the list of given elements (like linen, wood, paint) that I’m already using. The tableau allows me to bring in these other terms: the walls, the floor, the actual space between and around the paintings. In these newer works, I’m bringing those things inside of painting in a way. I find your paintings very human - they do things we do. They show a particular side or face, hide things, reveal their personalities over time. Do you think about these relationships? There is an anthropomorphic element that I can’t deny. One thing that started me doing this kind of work was another dream or daydream I had about ten years ago. I saw (in my mind) a painting come out from the wall and then slowly turn away, turning its face to the wall, refusing to be seen. It was a gesture on the part of the painting, suggesting that the thing had a life and a will. Yet I don’t look for that kind of life in the work too much. If it’s there it emerges on its own. What I feel I’m after, when I’m making the work, is playing out certain situations. Ideas about situations come to me: a painting with two backs and no front, or one with a cut-out area in the paint surface, through which we see another layer identical to what has been removed, or a painting overtaken by a wooden lattice, to the point that it’s almost obscured. I’m inundated with these kinds of thoughts. I’m not thinking about these things in psychological terms. But somehow the paintings themselves do these things that might have human parallels.